Hey it’s Christmas! I thought i should make a Christmas Special wallpaper, and started GIMP. And after 10 minutes it was ready. A very simple one with very least effects. I have described how i created the wallpaper in this post, hope you like it. Read the guide. Create a new canvas of size of your monitor resolution. In my case i made a 1280×1024 base canvas. Make the background white (#ffffff), name this layer “base”. Select the text tool from the toolbox. 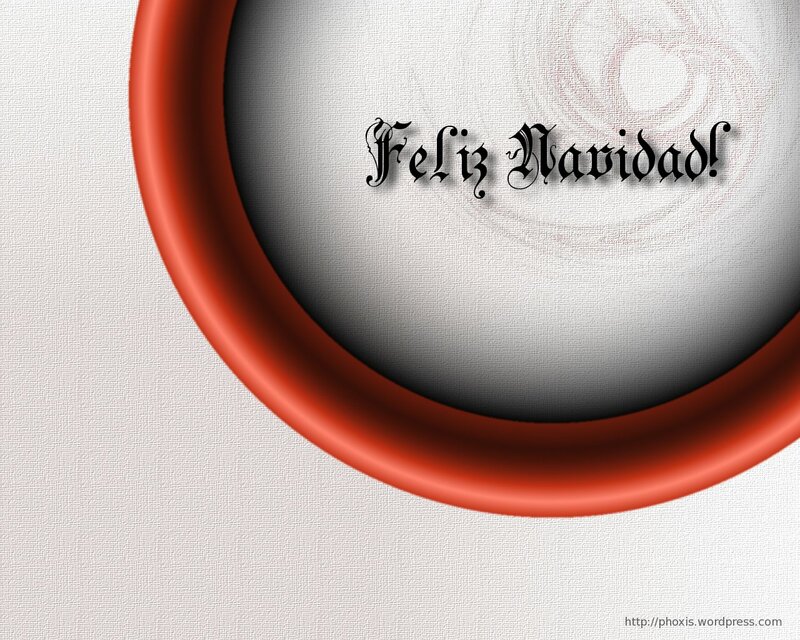 Select an area and write “Feliz Navidad!” or simply in English “Merry Christmas!” . I have used the font “Zenda” Downloaded from internet. Click on this link to get the font. The font size is kept around 140. Now drop a shadow off the text. Thats all we will do with text, and keep it simple. Create a new Transparency layer, from the layer tool box, name it “gradient”, and do the following on that layer in order to get the ring effect. Adjust the offset, opacity, and the Shape as your taste, but use Tube Red gradient. Then apply blur to the gradient two times, just to omit the sharp edges of the gradient. Draw gradient from a corner of the screen, make the gradient style square or spherical. After you have applied the flame, rotate the flame layer to a desired angle. Then set the layer mode to Burn. LayerBox -> "flame" layer : set mode to Burn. And at last the layers are as shown below, for you to have a look. And that was it. Sorry could not add Christmas trees, cherries, Santa hats and other Christmas stuff. Hope you like this simple wallpaper. This can also be used as an e-card. Just add “Feliz Navidad to …” and add the name in below lines. Zenda TTF font: Download Zenda Font from this link. Nice tutorial. Very simple and easy to follow and super result. By changing the words and color you really could use it for anything. Yes, this could be used as a base. For Christmas, which I have missed, the leaves, and all those Christmas stuff, can be added to this image easily. 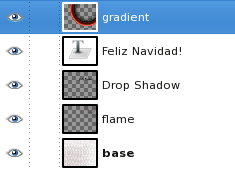 Google for “gimp Christmas brushes” , download and install the brushes you like and then use them. In my opinion we could add a couple of leaves, or a Christmas cracker on the bottom-left empty section, and then set the layer mode to Burn (like the heart). This will fill up the gap, and also keep the picture easy on eyes.